Please Note: Unfortunately, the Judge Wilson House was recently demolished. We have retained this page as a source of historical information. The Judge William Wilson House, a two-story Greek Revival building built over a period of three years from 1856 to 1859, is one if the rare pre-Civil War buildings still standing in Atlanta. Wilson was the son of early settlers in Atlanta. He acquired 1,200 acres from his father in 1839 and created one of the largest plantations in the area. While Wilson was serving with the Georgia Volunteer Infantry during the Civil War, his house was used by Union General William T. Sherman as temporary headquarters during the Battle of Atlanta. After the war, Judge Wilson served as a justice of the inferior court in Fulton County, a representative in the Georgia General Assembly, and as the sheriff of Fulton County. The exterior walls are constructed of fieldstone and mortar that has been stuccoed. The walls are reported to have been constructed by pouring the materials into a form. A two-story portico with a second floor porch was removed in the early 1960s when a two-story frame addition was constructed on the foundations of the portico. The original front door, now located in the addition, has an over light and sidelights. A screened porch is located on the rear of the building. The interior floor plan is typical of the Greek Revival style with a central stair hall and four rooms on each floor. Other Greek Revival features include molding around the doorways and windows and the high ceilings. Members of the Wilson family and their slaves are buried in a small cemetery located southwest of the house. A detached kitchen and several slave cabins were once located on the property. The kitchen was southwest of the house, but was demolished due to its deterioration in the 1960s. The slave cabins were located directly south of the house, but the exact location is unknown. The Wilson House remained in the family until 1962 when Dr. Thomas N. Guffin, great grandson of the builder, sold the property to the Holy Family Hospital so that it could be used as nurses' quarters. Most recently is was used as a community center by Southwest Community Hospital. 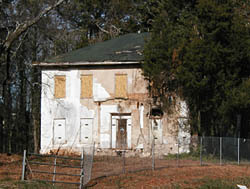 The Judge William A. Wilson House was located at 501 Fairburn Rd. in Atlanta.